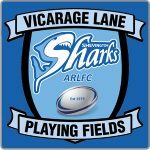 Shevington Sharks Amatuer Rugby League Football Club was established in 1979 with the support of Peter Deakin and is the third oldest club in the Wigan area, a fact everyone involved with the club is very proud of. Peter Deakin, now deceased, the ex-CEO of Bradford Bulls, Saracens RU, Warrington Wolves and Sale Sharks. Peter was, and always will be, one of the biggest names in Rugby administration in the country.